Changing Bits: Where are my new blog posts? Where are my new blog posts? Some of you have noticed that I'm not writing much in this blog lately. 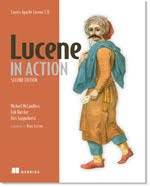 But fear not: exciting changes are still happening in Lucene, and I am still writing about them! It's just that most of what I write is now appearing at either the Elastic blogs or on my Google+ feed, so please head over to those two sources to keep reading about the fun changes in Apache Lucene and Elasticsearch.